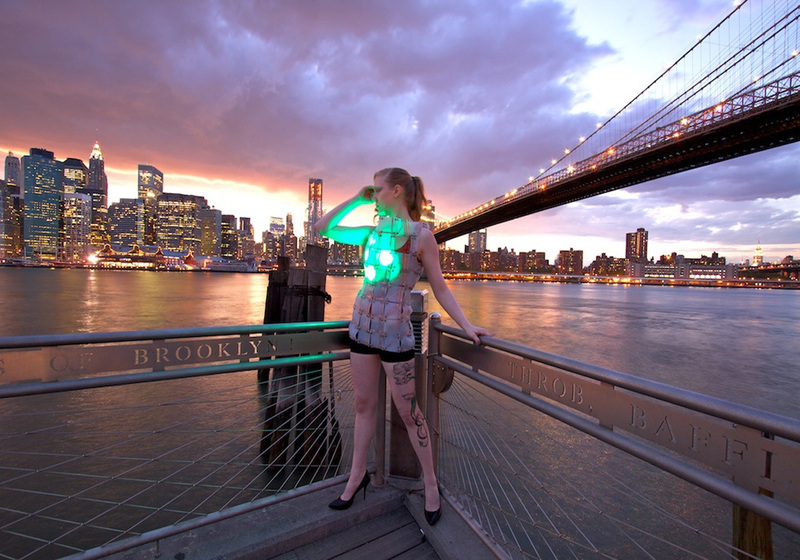 Photoshoot of the Life Dress with the sun setting on Manhattan in the background. In case a trend was not already apparent, I find light enchanting and—while frequently urged to ‘go away from the light’—it is inextricably linked with life. Pre historic man still sanitized his food and lit his cave with fire. Today, we surround ourselves in light, be it our car headlights, our computer monitors, or the light of our homes spilling out through windows. Each of my photo shoots for the Life Dress have been placed to feature such lights in the background. In this case, I chose the lights of my home, Manhattan, illuminating the skyline with office fluorescents, home incandescents, and plenty of LEDs.